The chapters in this book deal with persistent problems of Jewish identity. 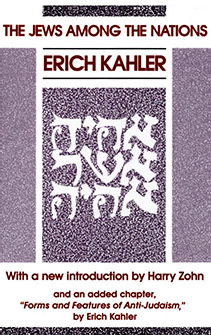 Kahler claims these can be fully understood only by awareness of the close interconnection between the singular ethnic nature and the unique social structure of the Jewish people. He discusses the Jews in Europe, specifically the historical implications of a strict tribal ritual that yet permitted the wildest spiritual scope, and, in the second half of the book, anti-Semitism, in particular Jews and Germans. How did the German people, seemingly so congenial to the Jews, develop a murderous revulsion against them, ending a long and fruitful symbiosis? Kahler sees this as a parallel to the parricidal rejection of the Jews by the Christian church. Erich von Kahler was a renowned mid-twentieth-century European-American literary scholar and essayist best known for scholarly works like The Tower and the Abyss: An Inquiry into the Transformation of Man (1957). Kahler was born in Prague, then part of the Austro-Hungarian Empire. He studied philosophy, literature, history, art history, sociology, and psychology at the University of Munich, the University of Berlin, the University of Heidelberg, and the University of Freiburg before earning his doctorate at the University of Vienna in 1911. In 1933, deprived of his German citizenship by the Nazi regime, he left Germany, immigrating to the United States in 1938 after a period of residence in England. In the U.S. he taught at The New School for Social Research, Black Mountain College, Cornell University, and Princeton University.